Custom Imprinted Solid Classic Sunglasses consists of UV400 lenses and thus they will give an awesome experience to the users while taking part in outdoor events. These custom sunglasses coming in adult size have an imprint area of 2" x 3/8" to display your brand logo before users. Blue, Maroon, Green, Neon Assorted, Neon Orange, Neon Pink, Red and Navy Blue are the colors in which they are available. Resorts and party supplies stores can make these sunglasses their promotional products. 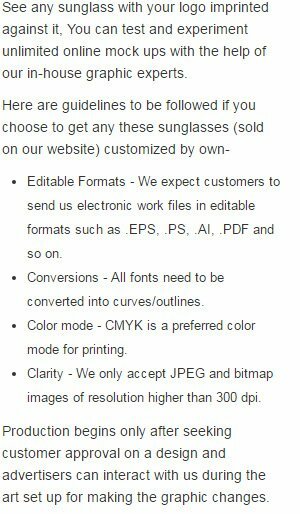 Order these custom classic sunglasses today to grab our free artwork design and free online proofs facilities. Request a quote to know savings that you can pocket on bulk ordering these Custom Imprinted Solid Classic Sunglasses. Available Colors: Maroon, Navy Blue, Red, Green, Neon Assorted, Neon Pink, Neon Orange, Blue.